This article about display is something I have wanted to do for many years. 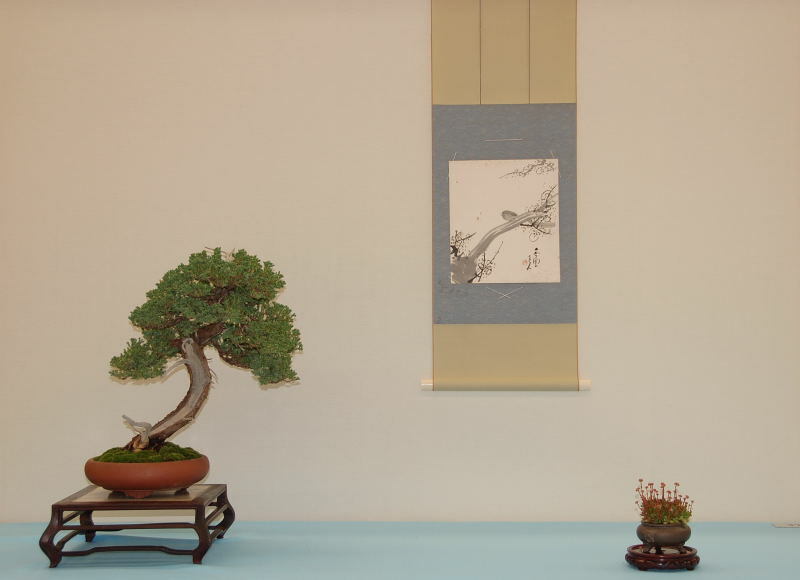 To display bonsai is a very personal idea. It is a projection of ones soul. Depending on the artists mood, the feeling of the artist will be displayed at that moment for all to see. That feeling will manifest itself in the placement of items within the display. Moving an accent to the rear or to the front of a display. Working in a feeling of femininity or masculinity, how one may feel about the season during the time of set up. All these play a role in the mood of the display. While I have been studying very hard about the subtlies of bonsai display in a formal Tokonoma, many that come to this exhibit still consider this a “tree” competition. That idea could not be further from the truth. Tokonoma display is not so much about any one component, but rather about the sum total of each article chosen to tell the story. The idea here is to assemble small articles of art into a cohesive story that can be instantly read by the viewer and deciphered with out hesitation. The idea is to tell the story through artistic depiction using a scroll, and secondary articles. I mention the scroll first because that is the heart of the display. 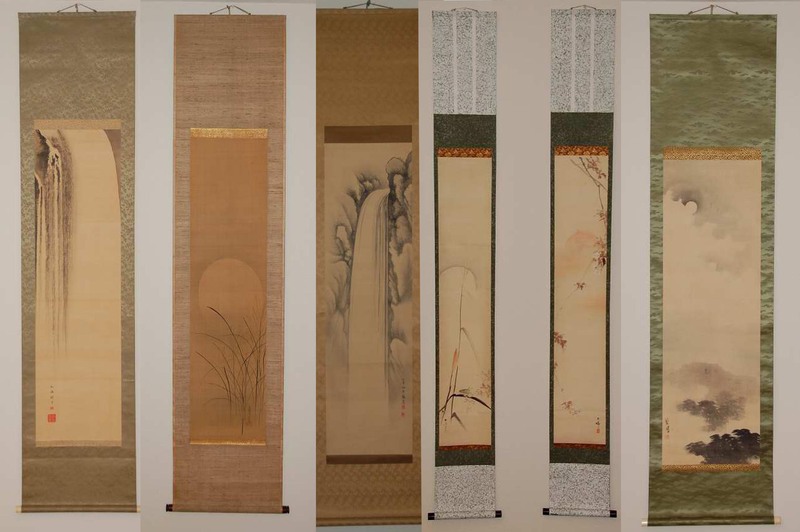 I am very fortunate in the fact that since beginning in 2008 I began purchasing tea ceremony scroll and have assembled quite a collection of scroll suitable for Tokonoma display in the venues we use. I have over 40 pieces now and all are quite simple in arrangement and allow the scroll to easily tell the season of feeling while not overpowering the display. So many times I see wonderful presentations only to be ruined by the wrong scroll. I might use this time now to talk about the use of Japanese scrolls to display western themed art. Scroll making in Japan is very old, centuries old in fact. And centuries before that China offered tea ceremony scrolls in temples where monks would study sutra written on the scrolls for hours. In Japan, scrolls have always been displayed in the traditional alcove with Ikebana, vase art/ incense burner, and But Sudan. More recently bonsai and Suiseki. These scrolls have always been relied on to help tell the season either in celebration or actual season. The Japanese use the sky, ocean and mountains to tell their story, as well as the moon, birds, animals and insects. The clever use of certain animals or insects, birds and fish tell stories of the seasons as well. In fact those that covet scrolls for display and follow traditional ways of years gone by understand fully the significance of what is depicted on a scroll. The image of Fuji, a famous and sacred mountain in Japan is celebrated each year at New Years. Fuji can be depicted with snow, clouds, rain, smoke, green trees, leafless trees and so on with each depiction capturing a specific time of year and even the time of day. The same of the moon. Cloudy, half moon, crescent moon, fuzzy moon, hazy moon, crisp moon etc., etc. No where else on earth is the depiction of nature and its surroundings and mans place in it found on something so special as a well executed scroll. Why not just hang a picture? One could. In fact the entry blank provides for a hanging picture upon entry. Why are they not used? A scroll offers something no framed art can. Soft edges. Carl Bergstrom wrote some years ago about the principle of the steelyard in bonsai display using the Japanese styled scroll. The scroll while long, vertical and displayed separating the tree and the accent goes a long way in balancing each of those elements. The placement of the scroll in relation to the tree, in relation to the accent can make or break a display. the easiest way to keep from having redundant themes in the display is to make sure the scroll is as simple as one can find. Keep the image to a house, an insect, a bird, no trees, or a moon or sun. That way it is easier to tell the story. Too busy a scroll and the message is easy to muddy. This is a formal scroll of Mt Fuji in winter. This would be appropriate for a winter exhibit or early spring untill March. Scrolls have a movement, like a tree. The movement can be subtle or bold. Sometimes the movement can be only a single blade of grass, or could be as bold as the entire branch of a cherry tree. The movement of the scroll dictates in which place the scroll will be seen adjacent to the tree. The scroll and the tree should “speak” to each other. For instance, a tree with right place movement should be used with a scroll with left place movement hung on the right side of the tree. This allows movement towards each other. The chop, or “hanko” on a scroll is usually placed opposite the movement of the scroll. It is placed there so as not to interfere with the meaningful part of the scroll. The viewer is interested in what is going on with in the tree/scroll confluence, and a chop there would ruin that image. There are times whan an artist may place a chop in the exact center of the scroll when an image has no movement. A good example of that is seen when looking at scrolls of symetrical Mt. Fuji. Take a look at the scroll below. A waterfall has movement as seen by the way the water flows. In the first scroll the water flows to the right, chop on the left. In the third waterfall the water flows to the left, chop on the right. In the second scroll with the grass and moon, one can see that the grass has movement to the left, the chop is on the right. The fourth scroll also shows a moon. The long piece of dry grass bisects the moon and shows movement to the right, chop is on the left. In the matching scroll to the right of the cherry blossom stem, the stem is shown in a hogarth curve, or line of beauty. The hogarth curve can either be symetrical or assymetrical. In this case it is shown assymetrically with the weight of the pendulum swinging to the left, chop on the right. The last scroll shows a moon with storm clouds, and some blurred trees at the base. The blurred trees in dark colors lend weight to the right side of the mostly white space scroll lending movement to the right. Chop is on the left. These “rules” are more guidlines since many people will use a scroll on whichever side they choose. Many times this does not matter since the direction may be subtle or multidirectional like birds flying. Is it correct to have birds flying away or into a scene? For the most part, birds fly away in fall and return in spring. Use ones own judgement here. Bottom line, when looking at a properly composed formal three point display with a scroll, painted properly, the chop will be on the outside of the composition. It will be noted that three of the display photos below taken from one of the best displays in the country, those of Boon Manakitivipart will show the chop on the wrong side. The question must be asked….are they aware the scroll has movement judged so by the painter by virtue of the chop, or are they just hanging a scroll with their tree because its “the Japanese thing to do”? These are a collection of scrolls appropriate for bonsai display. They are mostly seasonal scrolls or of natural seasonal dipictions. Frome left to right: Summer, Fall, Spring, Fall, Spring and Winter. While I am writing the piece, hopefully each will understand these are my points of view and surly cannot deemed concrete. I am no expert in the field of Tokonoma Display, but I am placing, and I am “getting it” from the judges perspective. All I can do is offer ideas the way I see them and hopefully some will agree. Having said that, I can now say the tree is secondary to the display. Anyone who thinks the tree is the anchor and the scroll and accent are supporting will never win a prize in Tokonoma display. Being the only person to have won two prizes, second twice, I can tell you I have the least favorite trees in the museum, but this idea is not about how good the trees are, it’s about how well you elevate the trees feeling thru story. With the right scroll, the worst tree in the competition can win the whole thing. It’s not a tree competition. Kokufu is a tree competition and they are displayed as such. Seki-Kazari. (Table top display)(More about that later) This is Toko-Kazari (Tokonoma display)and has absolutely nothing to do with Seki-Kazari, yet many come to this competition and set up wonderful Seki-Kazari displays with wonderful Kokufu caliber trees and then get all miffed when they don’t win. It is not paramount that a person hold steadfast to making the scroll the star of the show. The scroll and tree are interchangeable in that regard. Either can be chosen first to set the mood of the display, but always keep in mind that no matter what, the scroll is always going to be seen first. That split second will and should sell the season immediately while not always being overtly obvious. When done right the visual speed between objects in lighting fast. When it is, the viewer is captivated and will linger. It is then that subtleties will be recognized and small items are picked up on. When it is not done right the viewer is left confused and boredom is quick. Time to move on and see the rest of the displays. No payday today. Better luck next year. A tree can be used to depict almost any season any time. The real key is to make sure the tree used fits the theme of the scroll in telling the story or the season. This year was like that. Since it was a late fall, early winter season, I was struck at the lack of deciduous trees. Though here in the valley and the state, many with some of the best winter ready trees do not participate in this competition. Too bad since $2500.00 dollars in on the line. This year I also learned something very important. I was always under the impression that since we use such large scrolls, in many cases over 7 feet long, the tree had to be large. This year a very small juniper was displayed with a very large scroll and the composition really worked well. In fact so well I am working on a display for 2013 with a much smaller tree than I would normally use. Trees should be healthy and in peak condition. Wire should be held to a minimum or devoid of wire entirely. Lime sulpher should have been applied months before so as to age and look natural. Deadwood should be dressed and brushed of loose scaly bark. leaves should be shiny, healthy and free from lime scale. Tree should also be pest free. In our case we are bringing trees into a museum that houses baskets, scrolls and shoji screen in some cases a thousand years old. The archive of scrolls there is the largest outside of Japan and in fact has art pieces that are no longer found in Japan. The soil surface should be well groomed and moss should be applied preferably a few months or at least a few weeks before so as to look natural. The edges of moss pieced together like a puzzle should no be apparent. Any gaps in the moss should be dressed with a dark color uniform sized sifted stone. Wet Akadama looks good here as well as black lava or red lava. In fact a mixture of red and black lava with Akadama added is wonderful. The table plays a very important part in the overall feeling of the presentation. The stand should always be dark in color. Being dark is does not draw attention to itself. Lighter stands seem distracting and the viewer is left feeling “what’s wrong”. The stand should have ample legs or feet to carry the weight of the tree being displayed on it. The blade (top of the stand) should be large enough to adequately hold the entire pot in its center board. No part of the pot should creep over the framing edge. Tables when possible should be of a taller elevation to keep the tree reverent. Trees look more regal when displayed at a taller level than is normally seen. When using a table to display the main object on, the accent piece will be displayed on a Jitta or burl slice. The tree and accent piece should never both be displayed on a burl slice at the same time in a display. It would be appropriate to show a Bunjin tree on a burl slice and exhibit the Kusa on a black or dark colored ceramic disk. These disks from Japan or lacquer ware and can cost hundreds of dollars for one piece 8″ around. they can be made at home with thin wood paint and many coats of lacquer and wax. Jim Gremel many years ago made them from ceramic and glazed and fired them. They were pretty nice and held up well to pots, whereas the lacquer does scratch easily. Table should be cleaned well and waxed or oiled before use. Dust can show up in photo’s and can be seen by people that are on the lookout for that sort of thing…like judges. An example of a proper masculine stand. Ample for the tree but not overpowering. Great detail, traditional design. Another all purpose stand. A ladder design, very traditional, and light in feel. adaquate legs for sturdy visual support. Stand is too small visually. The pot size and the tree size dominate the image. Stand is also too short for a tree of this size. This is an example of a feminine table. The curving legs add some softness to the ruggen aspects of the tree. Overall calming effect. Display images shot by the author at Boon’s “Exhibit of Fine Bonsai”. This is probably where the most work needs to be done. In spring flowers should be held to one or two blooms and the rest in buds. Toko Kazari is about subtlety. The size of the stand under the accent. Is a flowering plant used, should it be a stone or a carving? In the end this last item is really very important. In fact it may so important that the best course of action is to leave it out. In Keido display, formally introduced by Takeyama and then taught to Kobayashi, Kimura and Sudo, the accent is left out and only a tree and scroll are displayed. Why? Sometimes that is all that is needed to encapsulate the perfect feeling. Don’t schlock it up. 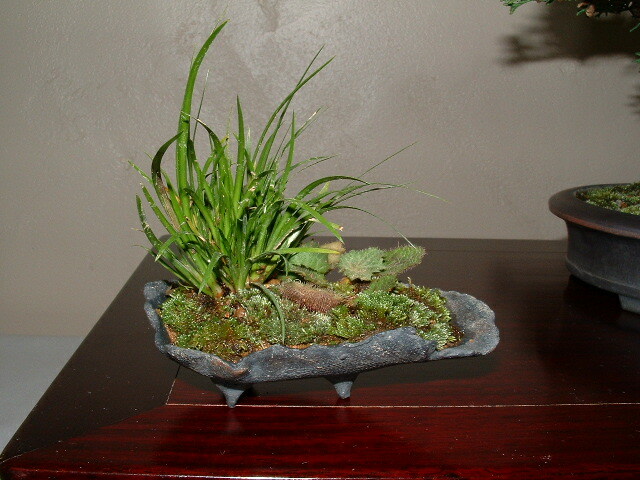 More often than not a Kusa in a Keido display will contain only one species of plant within the pot. This is just keeping the display on the simple side. Mixed species Kusa become distracting as the eye is constantly being drawn to the wonderful array of species growing in the pot. Save the mixed species for Ikebana. When using flowering plants for display, keep in mind the time of the season. Is it early spring, late Spring, early summer, late summer, etc.,etc. In early spring keep flowers to one blossom maybe two at the most. The species can also have a couple blossoms as to kindle the emergence of more flowers but no just yet. That is story telling. A late summer display may contain more flowers and no buds, but maybe an empty calyx depicting it is getting ready for summer and no flowers. light colored pots in the pastel range of blues , yellows and green will work for spring and summer. Pots of the Kusa can be more ornamental than the main object. This is where you get to show that small piece of creativity in about 6 square inches. Fall can be shown with dried grasses turning brown or tall flat leaved stems with burnt ends and edges from the summer just passed. 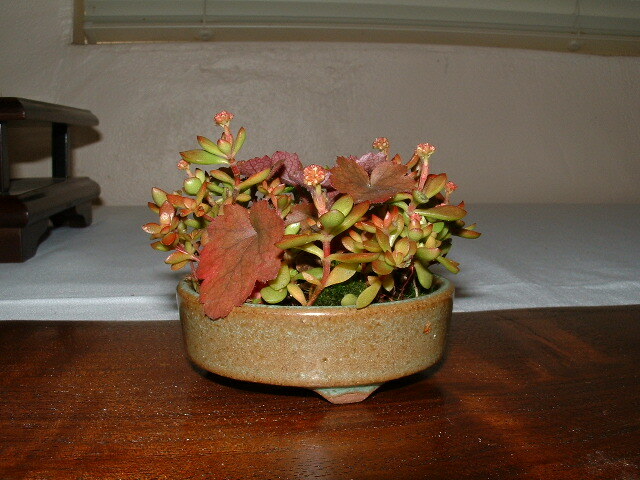 Small leaved succulents with reddish leaves are also good here and can depict most any season since they look much the same all year long unless blooming. Dark color pots are appropriate here, dark blues and rusty colored pots as well as unglazed pots look good in fall and winter. accents such as this can be beautiful on their own but detract too much to be part of a judged three point display. A nice small accent of only small sedums. Keeping to one plant allows the accent to tell us of the season. In this display we can see that the accent is kept small. It is also of one plant species and it has been trimmed close to the pot. It has been placed closer to the viewer near the tables front edge. This is just a general primer about what the main objects should look like. There is much, much more to display than just having a scroll, a tree and a kusa. Where does the scroll go? Where do I place the tree on the Tatami? Where do I place the accent in relation to the tree and scroll? Does the accent go in front of the trees front edge or behind the trees back edge? Is the accent too big or too small? Is my stand too small or too large? Do I have redundant themes in my composition? One will only know when you put your display together and open it up to judging or criticism. Weeds and insects should be dealt with before display day. New top dressing should be applied at the very least or else artistically applied moss. Special attention should be paid to leaving open places for the water to percolate to the soil thru the moss. These open spaces should be covered with top dressing allowing for naturalness around the tree. When trees are in training special attention should be given to wire on a tree. On the best side, a tree should be exhibited without wire. On the least side, if a tree is exhibited with wire it should look professional and tidy with no crossing wires and large aluminum wire. All trees wired for a display should be wired with the smallest wire possible to do the job. If this means copper wire then so be it. Lime sulpher should be applied well in advance of the display with no traces of sulpher fumes or yellow coloration visible. 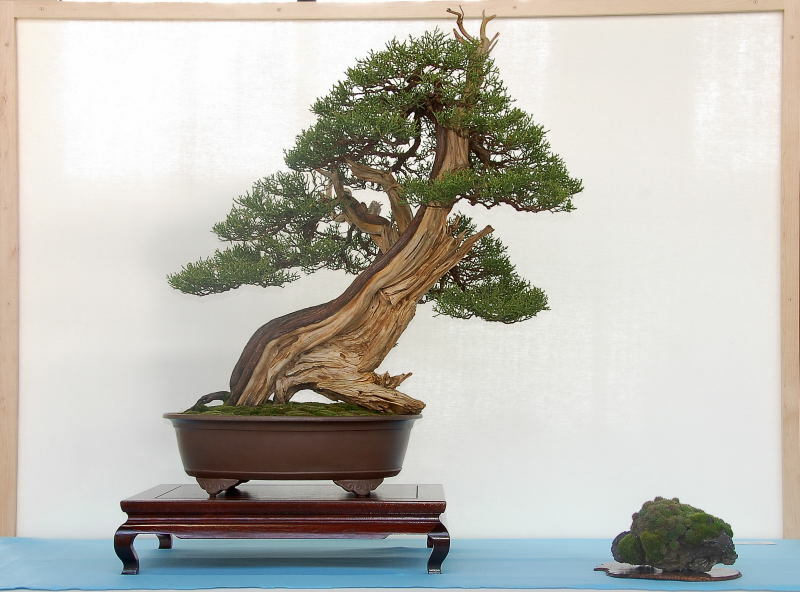 Shoku (stand) should be used on all bonsai in an exhibit. Like trees, stands have visual que’s that must be used properly if the viewer is to see the display properly. Que’s like masculine and feminine as well as formal or informal are visual tricks to help the viewer capture the essence of your display. Stands should be rather simple in design without carving or relief areas that distract from the main exhibit, “the tree”. Burl slabs are sometimes used for bonsai that require a heavy feel or forest plantings. Special attention must be paid to the thickness of the slab so it doesn’t overpower the exhibit. The slab should be at least half the thickness of the pot used. Stands for accents should be thin slices of burl wood or suitable grass matts. Bamboo mats are appropriate in summer and can add a cooling effect to display. Keep in mind that when displaying trees and accents together that the accent should be no higher than the top of the stand on the main tree. Stands should be polished before an exhibit using camellia oil or walnut oil. This oil is applied and allowed to set on the wood and then is buffed to a dull luster. It should not look wet nor shiny. Pots should be cleaned and free of dirt and fertilizer stains as well as a buildup of calcium. If pots are not clean it should be cleaned and prepared prior to arriving at the exhibit. Cleaning and oiling pots should not be taking place during the exhibit with viewers present. Professionalism of the exhibiter can only be measured by the preparedness of the exhibit for the viewer. Don’t look like the procrastinator. The correct way to prepare a pot for exhibit is to clean all stains and scour calcium buildup off with whatever means necessary. Pot should be oiled about three days prior to exhibit by applying mineral oil, camellia oil or walnut oil. Allow oil to soak in for a few minutes and buff with an old tee-shirt or suitable cloth. Pot should take on a warm luster and have no wet look or shine. If pot is shiny it needs more buffing. The tree should be placed just to off center of allowed exhibit area as to allow enough room for suitable seasonal accent. 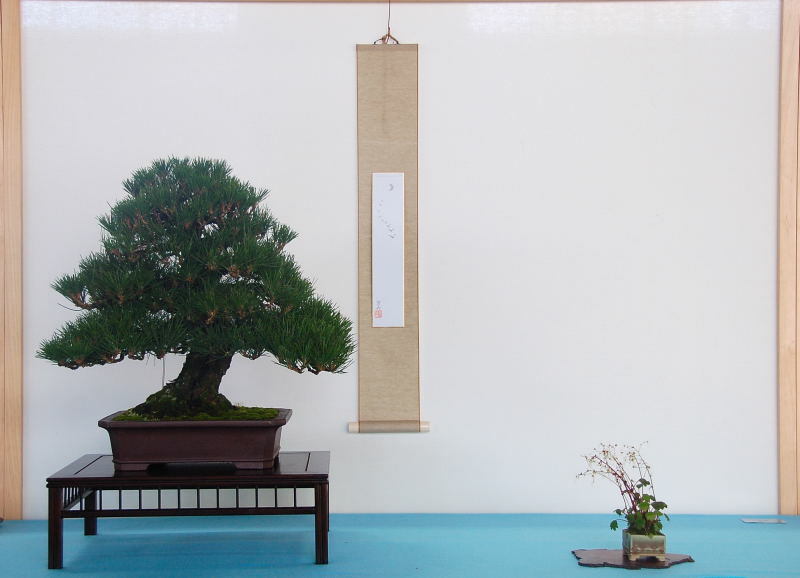 Tree should be centered on on the Shoku and pot should not creep over the center exhibit area of the Shoku. Shoku should be large enough to easily accommodate the tree being displayed. The accent should be placed to the side of the tree corresponding to the movement of the trunk line. In other words the tree and accent should communicate to each other. Trunk line is determined by which direction the trunk ascends from the soil in the bottom third of the trunk (tachiagari). In formal upright trees the accent should be placed on the side of the trees Sasha -Eda or focal branch, first branch. The accent should not be a focal point for the display but rather help support a feeling, this usually being the season. Accents with heavy flowers are inappropriate for bonsai and in early spring one flower with a few buds is all that is necessary.I should exhibit “mochhi” (patina). patina means a plant that has been in a pot long enough to have patina of age. It should not look like it was planted two hours before the exhibit. The ability to create art from plants is a very complicated craft. It takes many years of education and constant practice to develop art from something as horticultural diverse as a living tree. Our tools are designed by bonsai artists, with horticultural and functional ideas in mind. These tools are works of art and we strive to have every one produced in as many sizes as the pocketbook will allow. Our pots come from every corner of the world. Hand made, pressed into homemade molds and thrown on the wheel. Glazes cover the entire color spectrum and the breadth of color is breathtaking. Drips, fissures and crackled textures have elevated bonsai pottery into a collectable pastime. Our bonsai has been finely crafted from some of the most beautiful tools and planted into richly embellished and beautifully crafted bonsai pots. The bonsai is placed on the table for the photograph. The photograph registers the mistakes of the artist. The imagery has been lost on the improper stand. The stand may be too large or too small. The gender is wrong and now it glares for all to see. 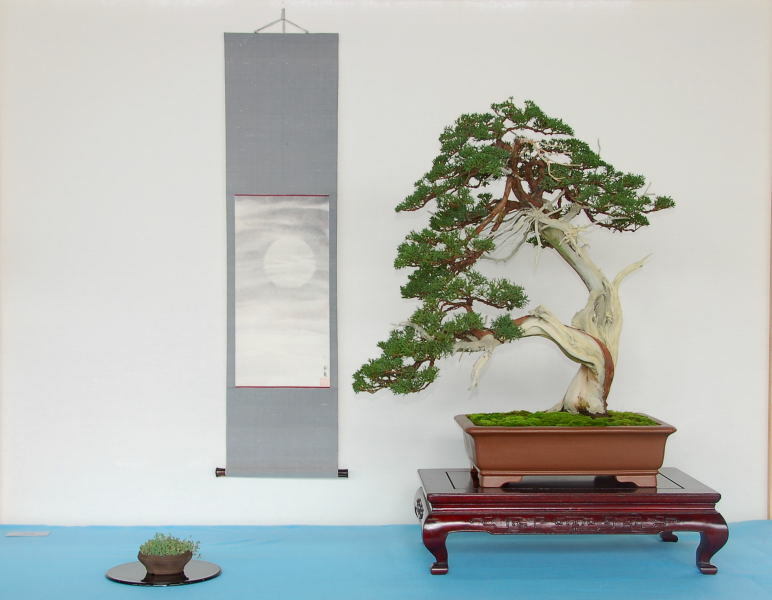 This short primer may shed new light on how to display a bonsai properly. Obviously, the top of a table must have a flat surface to hold the bonsai on the table. The structure holding this flat surface can be almost any configuration possible and it’s only limitation is the craftsmen’s vision. Curved legs or straight, carved legs, stretchers and loops. Racks and bi-level configurations round out the display persons arsenal. Display tables for bonsai can be grouped just like the forms associated with the plants or pots. 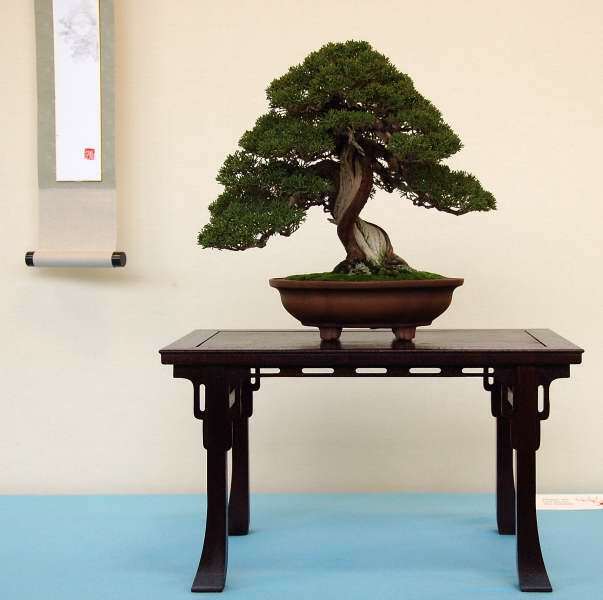 These terms again can be combined to narrow the scope of the table to just what the artist is thinking while placing the Bonsai on the table. The table could be a Formal Japanese with masculine lines. Or a Chinese Informal with feminine lines. There are clues, which can help us to determine what makes a table Japanese or Chinese. First, the legs are the first things that give away the country of origin. Most Japanese legs turn outward, while Chinese legs turn inward. These legs may be connected or braced with a stretcher or be left alone. Simple lines tend to be Japanese while intricate carving and garish lines tend to follow Chinese origins. Chinese stands also tend to me more polished while the Japanese counterparts will be more subtle in finish. The table should be of adequate size for the potted plant. The top of most tables will have a centerboard surrounded by a border. This border may me firmly attached or attached by a mechanical form of attachment that allows expansion. This expansion joint is critical to the life of the table allowing the top to expand and contract in differing humidic conditions. Since trees may display over a period of days, this moisture can transfer through the pot to the wood. Expansion with no place to go can cause mitered joints to expand and crack. The tree should have at least a good proportion of border around the pot to the expansion joint on top of the tale. The pot should be contained within the border and not cross over it. Crossing over the border is considered a fault in an exhibit. The height of the table should be proportionate with the tree and pot together. Compensation for Shitakusa should also be considered when ordering a commissioned table for a specific plant. The wood is also a consideration when choosing a stand as well as the type of wood. Some wood will have a busy pattern of grain and may deter from the composition. Color of the table is also important due to the harmony between tree, pot and table. The color of the trunk should be considered with pot selection as well as the color of the table. All three should harmonize and not detract from the over all image being presented. Keep it simple. Garish or over intricate stands deter from the overall image. Many times a good compositional image will be spoiled by a stand that overpowers the composition. There are times when the stand should just be put away and the tree placed on a slab or other suitable arrangement. Grass mats are to be used in spring and summer while wood slabs are used for fall and winter. Trees should always be held in reverence and placed on a suitable table. Be smart in the selection of your first stand and buy simple and a little larger than needed to help make use of the stand for other trees. Of course the best scenario is to have a stand for each of your prized trees making sure that each compliments the tree for it’s life. In Japan, black lacquer boards are often used to display bonsai. While these can cost hundreds of dollars to import, thy can be constructed from suitable boards and painted or coated with multiple coats of clear lacquer to simulate what is in Japan. Similarly, rough boards removed from a fence or old building can be arranged in an offset pattern and used to display bonsai. These type stands are often used to display Literati trees when a rustic appearance is desirable. Remember to keep it simple and don’t over do. Why is that upright tree on a cascade stand? A cascade stand can be used to elevate a tree to much higher proportions. It does not have to be a cascade or semi-cascade tree that is displayed on a cascade stand. Many times when a vertical element is needed or a fine tree needs a higher platform, a cascade stand can be used to do the job. It using the cascade stand for an upright tree many times a thin slab will be used and the stand placed on the slab and then the tree placed on the stand. Many times this is an ancillary arrangement using a small tree as a companion tree in a four-point display. Extremely informative and very helpful and enlightening . Thanks Christine. Are you the Christine that displays all the shohin in the European magazines? No I cannot take the credit for the shohin displays sorry to disappoint you. I feel sure I am going to feel more inspired to detail with my own bonsai. No unfortunately,great tutorial many thanks. I loved breezing through your site so far. I have a real passion for everything from soil chemistry to the various types of actually displaying trees. Thank you for writing this very in depth and, by nature of the art, open-ended “how to” from your own experiences. First summer in Fresno and nothing has died yet 🙂 I look forward to reading more. Send me an email at the end of August and I can update you on Fresno club meetings. They begin again in Sept. Summer is just too hot. very informative and an eye opener for beginners like me. Thank you.